Peter’s comments above show that he intends the swirling movement of this sculpture to represent two things: the movement of the dancer during the dance, and the extravagant pose they contrive to finish in as the music ends. The watching crowd appreciates someone who can strike a pose! 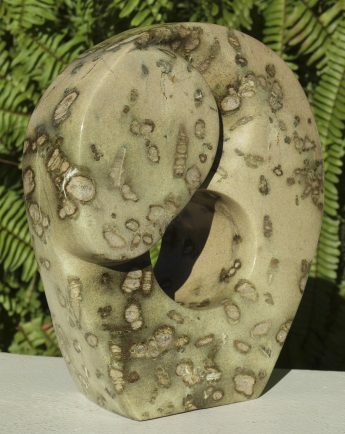 This lovely little piece is excellent value for money for a unique sculpture. It is fundamental for Guruve that our smaller pieces are of equal quality to the larger pieces, so customers with a smaller budget do not have to compromise. It would also make a stunning gift. Domboshawa opal stone is the local Zimbabwean name for this particular pale white-grey variety of serpentine stone. 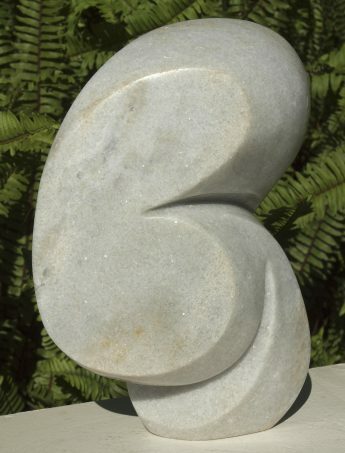 It is one of the softer stones we show, so we do not recommend it for outdoor display – but this piece is far too small for a garden setting anyway. It comes from the Domboshawa area about forty kilometres north of Harare. The gorgeous pinkish hue is from where the stone weathered slightly before being selected for sculpting.